This elegant, easy-to-make dessert keeps its shape when thawing rather than melting, so you don't need to rush to serve. Place the cantuccini in a shallow bowl, drizzle with about 4 tablespoons of the Vino Santo and set aside for 5 minutes. In another bowl, beat the mascarpone and icing sugar with a wooden spoon until smooth. In a separate bowl, whisk the cream until it forms soft peaks. Gently fold into the mascarpone mixture and add the cantuccini. Line a 900g loaf tin or terrine with clingfilm and spoon in the mixture to a depth of about 3cm. 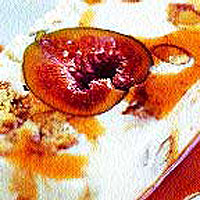 Place the figs, sitting upright, down the centre of the tin and push down (take a slice off each side so they fit snugly). Spoon the rest of the mixture over, making sure it goes round the curves of the figs without leaving air pockets. Cover and freeze for at least 4 hours until frozen. To make the syrup to drizzle over the semifreddo, pour the remaining Vino Santo into a small pan and allow to bubble for 8-10 minutes until reduced by two-thirds. Leave to cool. Turn the ice cream out of the tin and remove the clingfilm. Using a large sharp knife, cut 6 slices, placing each on a plate. Drizzle the syrup over and serve. Slice the semifreddo while still frozen but slightly softened: transfer from freezer to fridge for 30 minutes before slicing. Return any remaining semifreddo to the freezer and use within 1 week.